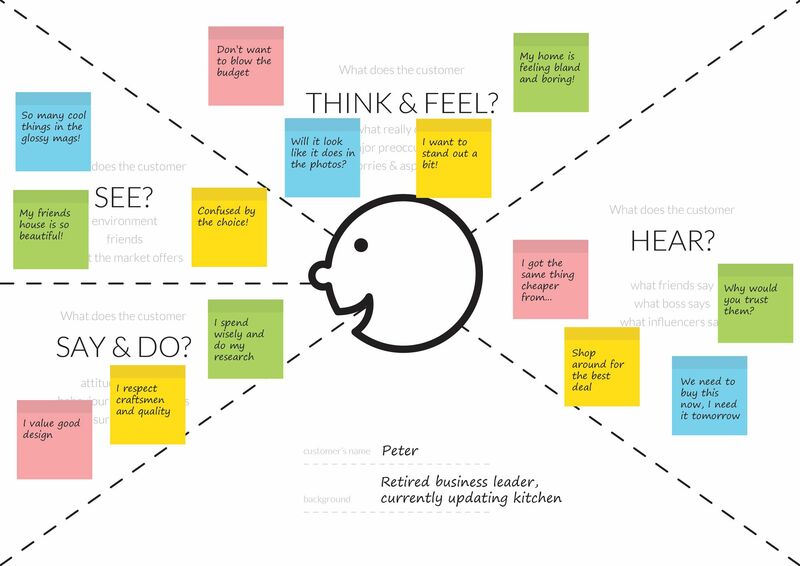 News And Insights » User Journey Planning – What is an Empathy Map? The importance of the user journey. Here we investigate empathy maps - a simple activity that should form part of the process of your user journey workshop. 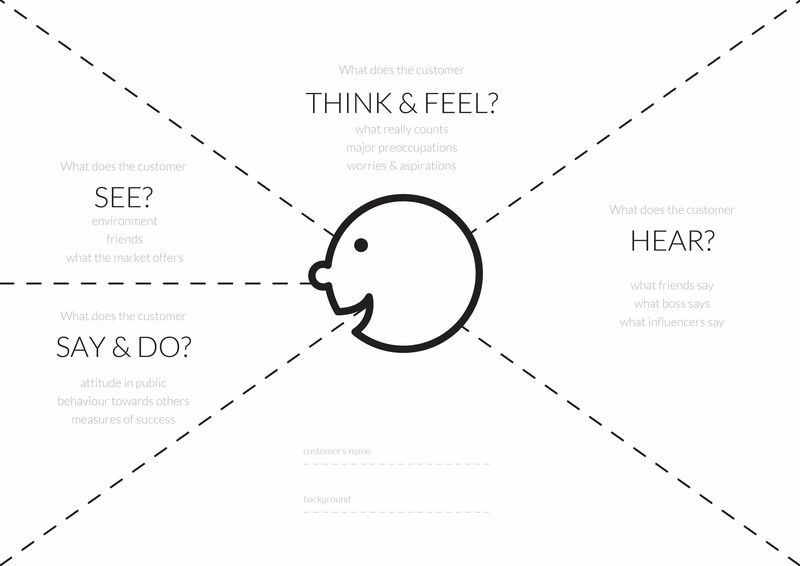 Empathy maps are a really simple activity that should be part of your user journey workshop. They are fun to do and help you gain a better understanding of your customer segments to make more informed design decisions and improve the user experience. Empathy maps can also help to identify things that you previously didn’t know about your customer types. Empathy maps are part of a collaborative exercise that will very quickly allow you to capture insights about your customer types; what they think, feel, hear, see, say and do. To get the best results, make sure you bring the right people into your workshop; all of your senior stakeholders should be there along with a senior business leader/decision maker. Ideally there will be a strong mix of marketing, design and representatives from all business areas. Most importantly, if at all possible, you should have somebody there that understands the customer’s experience of using the site first hand. This is usually somebody from your customer service team. They will have a clear understanding of the different customer types and will be able to recognise their key characteristics and behaviour. This is valuable information that comes from listening to the customer directly as they use the site and experience the pain points that let the journey down and where the ‘happy moments’ occur. If you don’t have this business intelligence available then you can still proceed by using your best judgement and experience to create hypothetical examples. When everyone is gathered together, you should first identify all of the main customer types and create an Empathy map for each one. Using marker pens and post-it notes collaboratively fill in each template in turn. Don’t worry about being too specific and accurate at this stage, the idea is to get the information out of your heads and onto the paper as quickly as you can. There will be time to evaluate and refine each one later. To fill in the form you need to first give the customer a name, something that reflects their demographic well, then give them an occupation or brief description of who they are. Next, answer what the customer thinks and feels, what they hear, what they see and what they say & do. Think about how the user thinks, feels, why are they on your site and what might they be concerned about or aspire to. What external influences might they be exposed to? Peer pressure, things they see on social media – what are they hearing from other people, other brands? What do they experience when trying to buy, wear, fit and use our products? What they say, what they do, what they stand for and put a value on. Looking at the hypothetical example above, you can see that Peter, our target user is looking for a quality product that is well designed, but he is budget conscious and hearing negative things from within his influence group, which may sway his decision-making. These small insights all help to build a bigger picture of the customer’s concerns, desires and where they encounter weakness within your website. They should inform the marketing strategy for your website and help to make more intelligent decisions when it comes to the site architecture and hierarchy of messaging on the page. Download our free Empathy Map Template here.